Note: As an ENELL Racing Ambassador, I receive race entry fees and merchandise, but I genuinely love the brand. All opinions here are my own. 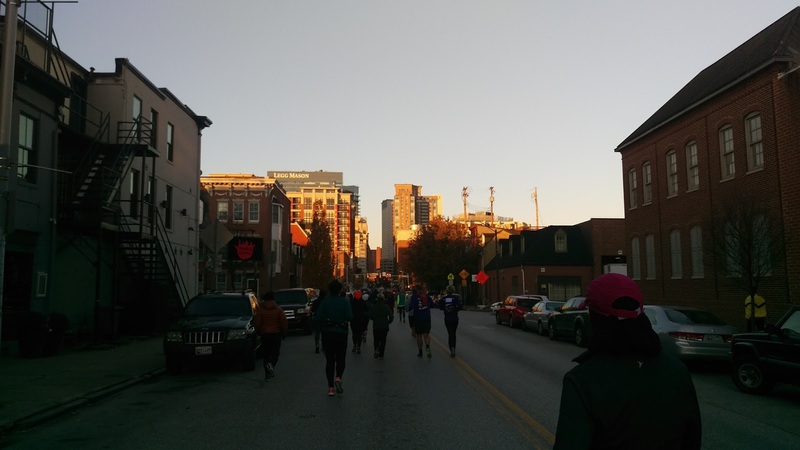 Last weekend, Matthew and I ran the inaugural Baltimore Race 13.1 10k. I know that sounds confusing- the race's name is "Race 13.1" and they offered a half marathon, 5k, and 10k option in Baltimore. Because Matthew and I had six miles on our marathon training plan anyway, and because we rarely find any 10k races in our area, we signed up for the 10k race. 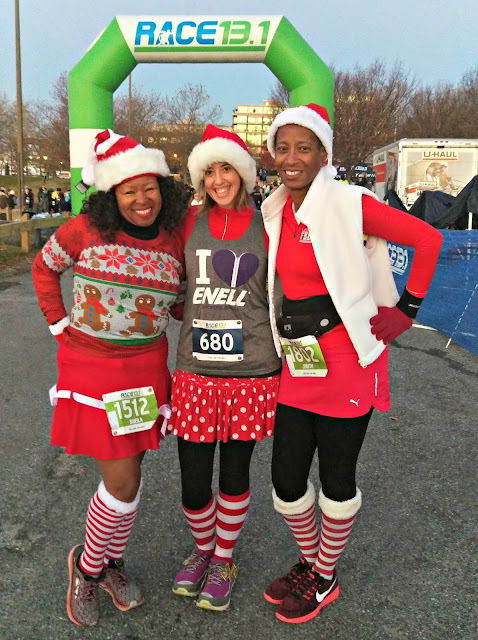 Naturally, I had to wear my "Rock It Red" ENELL for this holiday-themed race. Matthew and I chose to pick up our packets race morning. We parked in the recommended lot ($15) and walked the short walk down to Canton Waterfront Park to pick up our bibs and shirts. It felt 20 degrees colder when we were down near the water! This race started at 7 am and packet pick up was advertised for 5-6 am- so it was still dark out when we got our stuff. We opted to head back to the car and sit in the warmth until the race start- of course, not after we made a pit stop at the brand spankin' new port-o-potties! 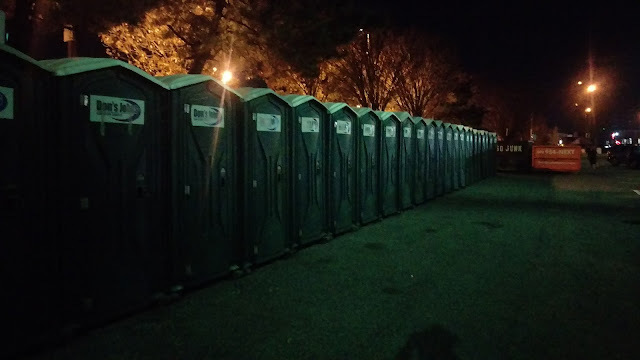 New, clean port-o-potties with no line?! Every runner's dream! 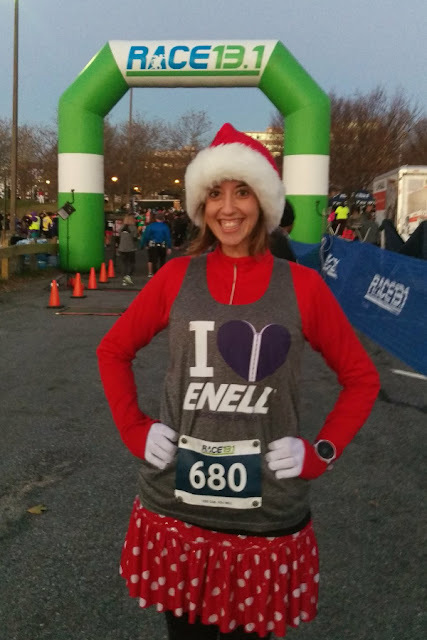 The back of the shirt has the race's mantra printed on it: "You can. You will." 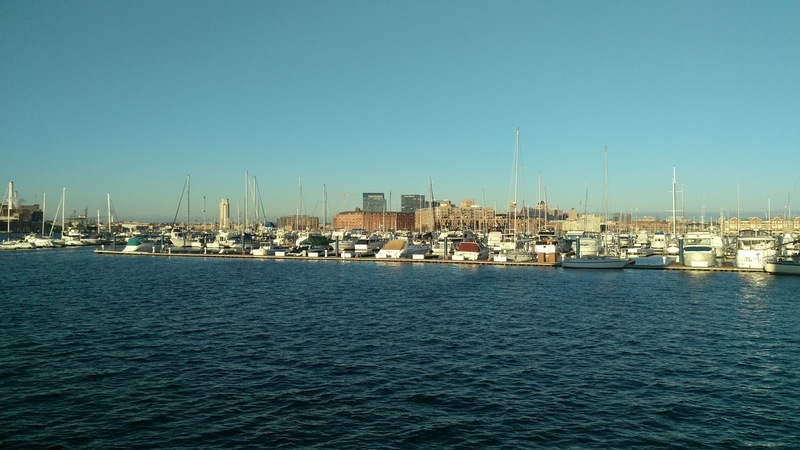 At about 6:40, we made our way to the starting line in Canton Waterfront Park. 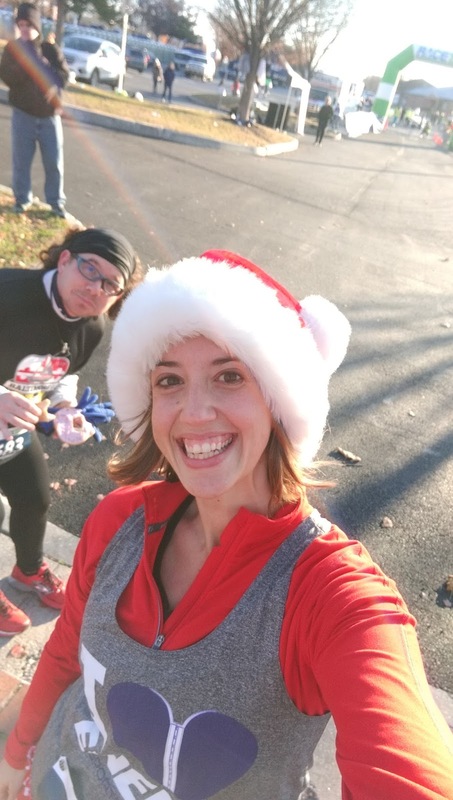 We noticed the different colored bibs for the different distances and realized that there were very few 10kers in comparison to the half marathoners. The half and 10k were going to start at 7 and then the 5k would start at 7:10 am. After a quick playing of the National Anthem, the race began! The half marathoners and 10kers would follow the same course for the first three miles and then the 10kers would turn around to head back to the park and the finish line. 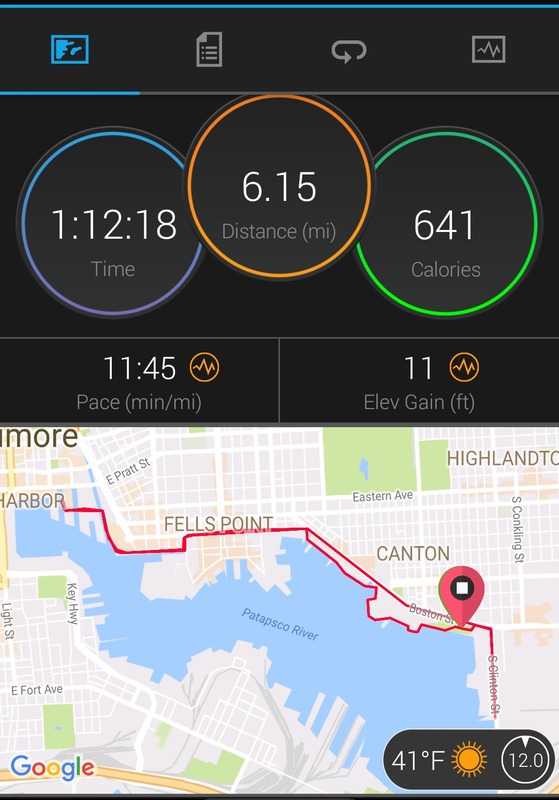 This course was very different from most of the Baltimore races I've done- mainly because we did very little running near the Inner Harbor, where most of the Baltimore races start and finish. This course was pretty easy to follow- there were plenty of volunteers and police out there making sure we knew where we were going and making sure we were safe. The course wasn't totally closed; there were times where the police had to stop traffic to allow the runners to safely cross the road. But there were absolutely no issues at all with us being able to run our race and feel safe. A beautiful day for a race. The turnaround point for the 10k was right near the National Aquarium and it was well-marked. Matthew and I were keeping a pretty good pace averaging right around 11:45 minute miles. I noticed that my Garmin was picking up the miles a few hundred feet before the posted mile marker (not unusual) until mile five. We saw the mile marker for mile five and then my Garmin didn't hit five until well after the mile marker. 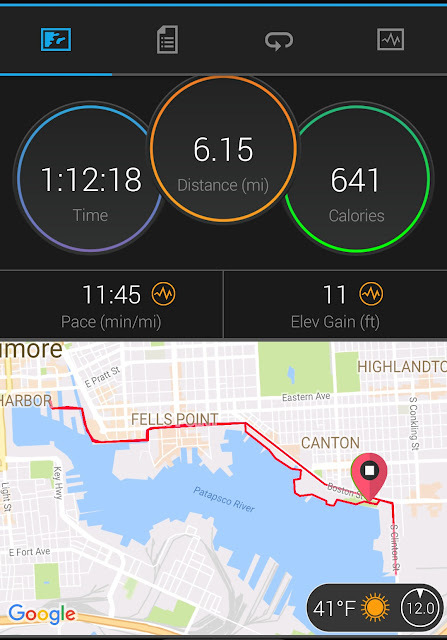 In fact, my Garmin recorded the race as being 6.15 miles long, not the 6.2 that is the correct distance for a 10k. Weird, but not totally unusual for my watch to be different than the course. 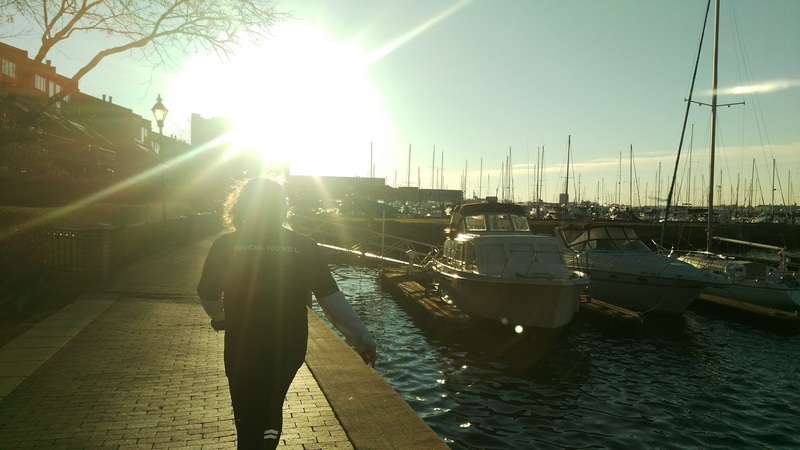 The views on the way back to the finish were absolutely stunning- watching the sun come up over the water was so gorgeous! However, I wished I'd brought sunglasses- it was so bright! I also ended up being over dressed. Around mile three I was so damn hot. 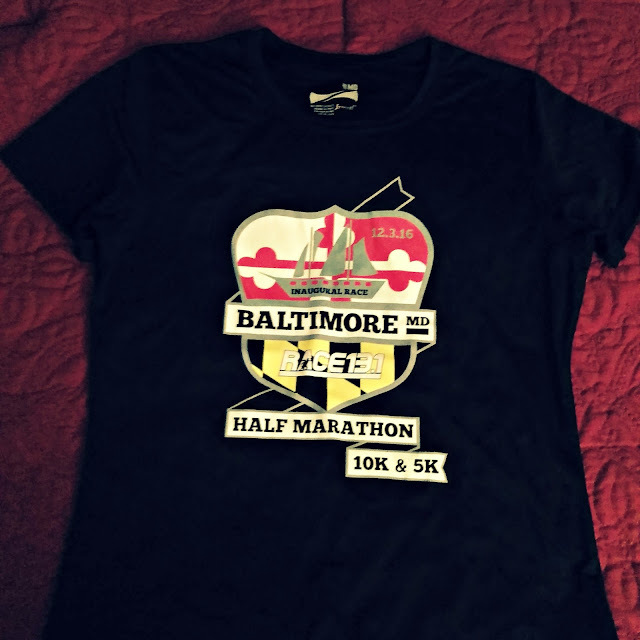 I should have left the race shirt in the car. 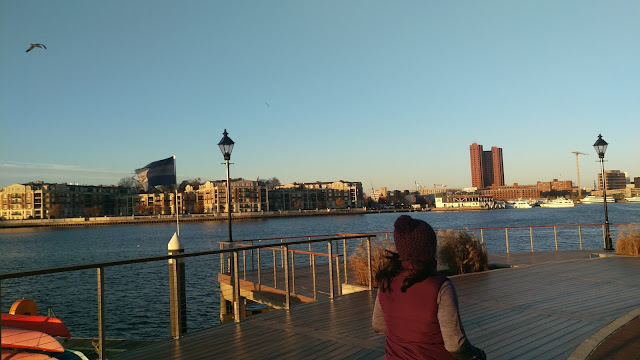 The Inner Harbor from a different angle. 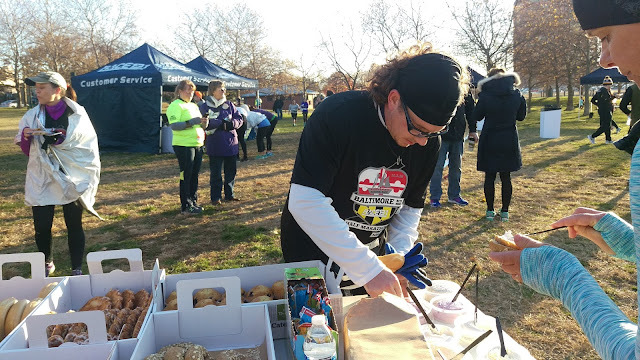 When we finished the race, we headed over to the food table. I was expecting some water and bananas but there was so much more! 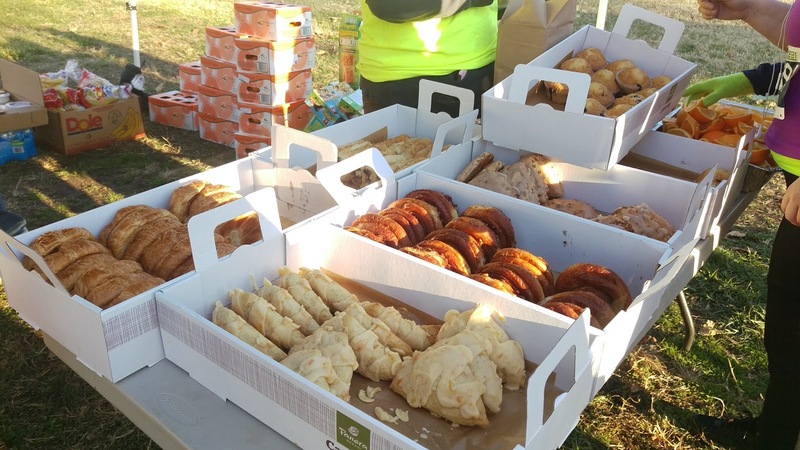 Panera bagels, bear claws, scones, etc. It was quite a spread! They also had computers there where we could check out our official finish time- 1:13:37. Matthew grabbed a bagel, I got some fruit, we took a few selfies and then headed back to our car. What's better than a Panera bagel?! 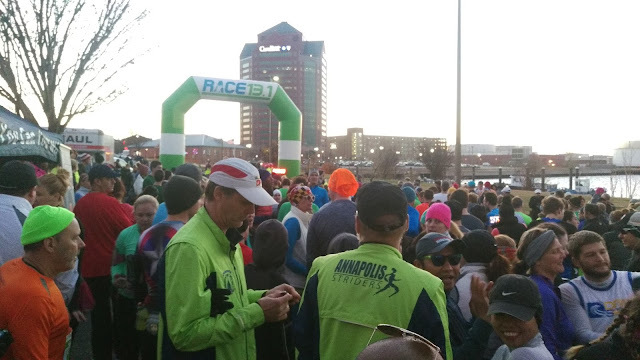 Have you participated in a Race 13.1 race before? What did you think? 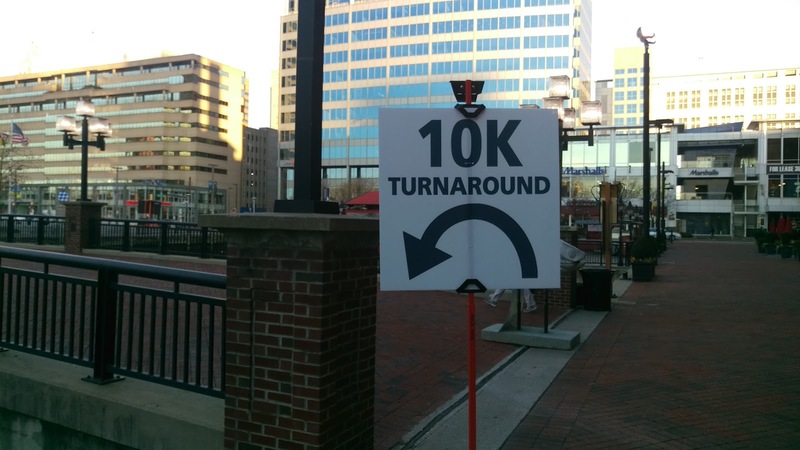 The half course went down my street in Locust Point. Literally past my house. Which I didn't know until I woke up in the morning and saw runners up and down my street! So funny! Glad you had a good experience! I may have to run this next year (this year I opted to sleep in and rest up for my 30th birthday party! ).